Sanyo TV is one of the emerging brands fighting fiercely to provide coveted high-end TV features at an affordable price. 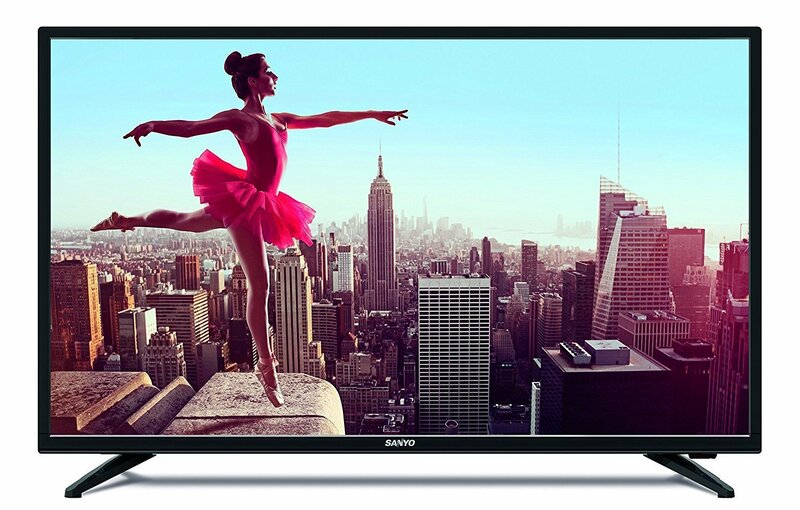 Competition in the budget LED TVs especially in the e-commerce space is slowly picking up and Sanyo is no new brand for it. They have refreshed their presence with exclusive tie-up with Amazon to supply their LED TVs. To give you an Indian connect, Sanyo was founded in 1947; so this brand has its inception rendezvous with our new era of freedom! Sanyo in Japanese means 3 oceans—name in-line with the ambition of its founder—to make company’s mark across the globe by serving in 3 most important oceans: Atlantic, Pacific and Indian. Sanyo was one of the rare brands to be featured in esteemed Fortune 500 list. Few years back another Japanese major, Panasonic acquired Sanyo. Panasonic relaunch this brand in India with exclusive tie-up with Amazon last year to provide Indian consumers with quality LED TVs at an affordable price. And the result was—Sanyo became most reviewed brand on Amazon in the TV category. So, Sanyo is for Amazon what Vu is for Flipkart. Sanyo is presently providing with up to Full HD i.e 1920×1080 resolution for its high-end TV range. Though it has released 4K TV some time back, but then that’s presently restricted to North American market. We would like to see Sanyo offering even to Indian consumers. Now, talking about Full HD resolution, it gives a good picture quality with sharper details and vivid colors. It uses IPS (In Panel Switching) panels which provides a wider viewing angle compared to conventional LEDs. Sanyo uses Omni-Viewing technology its premium class LEDs to deliver wide viewing angle of up to 178 degrees. Sanyo TVs have inherited Super Bright technology from its parent—Panasonic. This technology helps in providing more brightness into the pictures by putting efficient LED lights behind IPS panel. This makes pictures look crispier and dynamic even from a wider viewing angle. Another important thing is that Sanyo uses A+ Grade Panels for all its TVs. This is a welcome move as it helps in providing a better color transparency. Sanyo TVs especially the premium ones, are powered by Dolby Digital—a digital coding technique that reduces redundant data to produce high-quality sound. The strength of Dolby Digital lies in compressing the size of multichannel audio files without disturbing the sound quality. What Dolby Digital does is, it takes cues from how human ear processes sound and implements it in its own functioning. It provides 5 bandwidth channels: front right, front left, center, surround right, surround left for amazingly true sound feel. Thus, it expands right and left conventional stereo channels to give listeners enveloping 360 degrees of sound. This arrangement also helps in providing clean, crisp dialogue delivery of the onscreen sounds. Dolby Digital is known to deliver lively multichannel sound at low data rates. It also has Low-Frequency Effects (LFE) channel to grant deep, powerful bass effect to the listeners. This feature works great when there is a need to provide sound for special effects in action sequences in movies. Sanyo premium TVs also have HDMI Sound Out capability which helps to connect with an external home theatre system to enjoy thrills of theatre at home itself. Audio Only is another audio feature which simply turns off video screen of Smart TV and converts it into user’s favorite music player so they can enjoy delectable music peacefully without any distraction. Given all the strengths Sanyo can boast of, there is a caveat too; though couple of popular audio formats like MP3, AC3, AAC, are supported, you’ll find hard time playing a WMA format files on a Sanyo Smart TV. Sanyo Smart TVs comes with all the necessary connectivity options that a user would look for. So, for its top-end models like 49S8100FS it provides with 3 HDMI ports which facilitates multi-tasking, reducing the constant need to switch cables. Also, it has 2 USB ports so users can connect a couple of devices, say a pen drive and hard disk simultaneously. Not to forget, being a Smart TV, WiFi is a necessity and premium range Sanyo TVs are equipped with WiFi connectivity to give uninterrupted entertainment. TV marketers use different specs to market, and one of the lesser known entity is refresh rate. Refresh rate measures how frequently a TV switches the image (sometime called, “frame”) on screen. Mainstream TVs have 60 Hz as source frequency. This in layman’s term means that TV switches 60 times each second. Sanyo’s HDTVs have a refresh rate of 60 hertz. Refresh rate matters the most while watching fast paced program like an action-packed live sports event or a fast action thriller movie. Sanyo has developed Magic Eyes technology to counter motion blur which usually occurs while watching fast-paced action scene like for example an F1 race. Magic Eyes technology is designed not only to reduce distracting motion blur but it also enhances the skin tone so that pictures manifests as true colours as they can for better viewing experience. Though the actual refresh rate of Sanyo TVs is 60 hertz which appears to be bit less given its counterparts like Vu are offering actual refresh rate of up to 120 hertz. There are areas where Sanyo shines bright considering its price tag but then there are murky areas too. When it comes to design, it’s pretty simple and sober but the form factor is thick. Now the good thing is that Sanyo Smart TV’s weight is on a lighter side which makes it easier to carry around and install. There is problem with port locations in few models like 32S7100F, where HDMI ports are located at the bottom and it becomes little difficult to access it. Similarly, there is another problem that two USB ports given are close to each other, meaning users might have hard time connecting 2 thick pen drives. When it comes to picture quality it can’t really match with OLEDs from LG or QLEDs from Samsung. Also, no availability of 4K TV in Indian market means users must be content with Full HD if they wish to choose Sanyo. Though the panel in general is bright but edges seem to be slightly over sharp. Color reproduction isn’t as accurate as of that Sony TVs. Whites are skewed towards blue so they seem to appear cold; while reds, blues and greens lean differently. But Sanyo TV atoned this in the darker scenes with its good contrast ratio where night scenes from action packed movies get pleasantly dark and mysterious, enriching the genre of those scenes. When it comes to audio quality, Sanyo excels its budget competitors like Vu and Micromax, thanks to its Dolby Digital technology. With a decent sound quality, sound volumes are pleasantly loud and clear. Though the mids are pretty accurate but high and lows are not that good. But given its size it exceeds what one can expect from it in audio segment. Sanyo being a Japanese brand and subsidiary of Panasonic one can expect a decent quality and string customer support. Sanyo has more than 250 service stations in India, which can alley the concerns people have in its after sales support. Sanyo is the Panasonic’s attempt to explore and conquer the budget segment Smart TVs, where it will have to tussle with the likes of Vu, Micromax, Cloudwalker etc. While Indian brands like Vu and Micromax are comparatively newer brands, Sanyo outshines them with over five decades of experience in manufacturing diverse range of electronic/electrical products like TVs, ACs, washing machine, batteries etc. Sanyo should be your choice if you have slightly contrasting taste, like you love bright panels but then also enjoy playing dark scenic games with a loud and surround sound; but given all this in a restricted budget.